As you know I travel for my job with Zumba. If you know me or follow me on facebook, twitter or instagram this comes as no surprise since my posts range from "I'm in Montana for trainings" or "in PA for QVC" to "heading to Japan for a AFAA conference"...you may even wonder if I am actually EVER home. My husband holds down the fort while I'm away. He is not just your typical guy who "manages" okay while the wife is away-this man is remarkable! He does it all-cleans, plays with the kids, helps them with their homework, even down to braiding our daughter's hair for school all while holding down and job of his own. Something he does for me to make me feel more connected and not so home sick while I'm away is to send pictures throughout the day of what he and the kids are doing as well as sending me funny sayings the kids come up with. Today I got this message, this is Miss B talking to Brian. "The cool thing about Heaven is that you can't fall out of cars, because there are no cars!" I'm wondering if there are certain details my husband is choosing to leave out when we have our talks and catch up on the happenings of the day. Perhaps like our daughter falling out of a car and her newly spiked appreciation for heaven and it's lack of automobiles. If this is actually the case I may have to start leaving out my trail of purchases in Targets around the world that entice me with their great bargains and mom friendly clothing. Example of a pic I got. 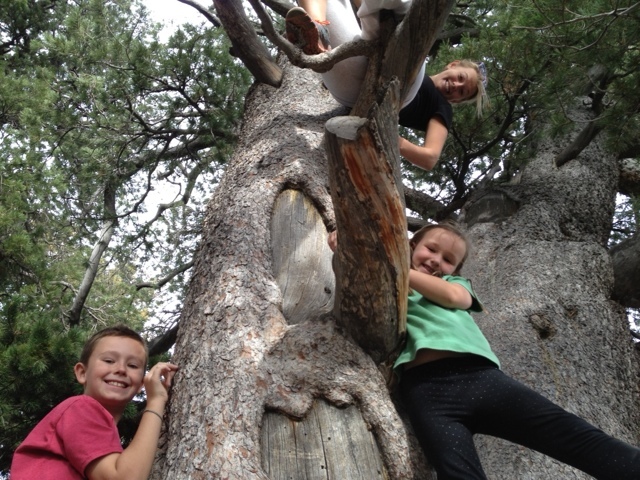 Kids and Aunt Heather climbing a tree. Priceless. God Bless your babies! They r beautiful! Your babies are beautiful!! God Bless!